North Korea has said it is considering carrying out missile strikes on the US Pacific territory of Guam. According to The North's official news agency, The North Korean army are “carefully examining” an operation plan for attack on Guam: The KPA Separate DPRK army statement says military action by U.S. will be met with "just all-out war." North Korea’s Strategic Force of the Korean People’s Army (KPA) is examining an operational plan for a medium-to-long-range ballistic missile attack on the island of Guam, a spokesperson for the organization said in a statement carried by the Korean Central News Agency (KCNA) on Wednesday. The plan, the details of which were reportedly outlined yesterday, is in response to the U.S.’s test launch last Wednesday of the Minuteman-3 intercontinental ballistic missile (ICBM) from California’s Vandenberg Air Force Base and of the recent arrival of six B-1B Lancers at the Andersen Air Force Base in Guam. 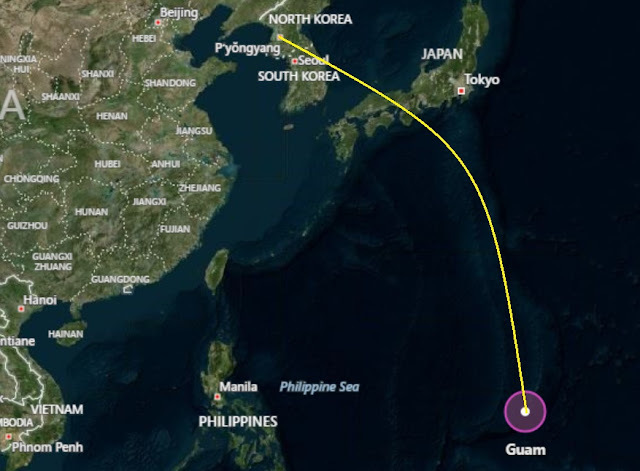 Guam is a U.S. territory and home to several American military bases. The plan will be “will be put into practice in a multi-concurrent and consecutive way” on the order of Kim Jong Un, it added. In a separate statement also released on Wednesday, the General Staff of the Korean People’s Army (KPA) condemned recent talk of military action against North Korea from policymakers in the U.S.
A military intervention against the DPRK would be met with a “just all-out war,” the statement said, which would seek to destroy “the strongholds of the enemies including the U.S. mainland.” “…the army of the DPRK will turn the U.S. mainland into the theatre of a nuclear war before the inviolable land of the DPRK turns into the one,” the statement added. Referencing recent comments by Senator Lindsey Graham, as well as Secretary of Defense James Mattis and Chairman of the Joint Chiefs of Staff James Dunford, the KPA promised a “preemptive retaliatory operation of justice” if it saw even a “slight sign” of a U.S. “beheading” operation against North Korea’s leadership. “Once the U.S. shows a sign of starting to carry out the foolhardy plot, we will launch the Korean-style pre-emptive retaliatory operation of justice to annihilate the masterminds of the thrice-cursed operation and all the criminals involved in it,” the statement reads. “The “secret operation” touted by the U.S. policy-makers is a foolish scheme aimed at bringing down the social system of the DPRK,” it added. The comments by North Korea’s military come hours after U.S. President Donald Trump promised “fire and fury” against the DPRK should it continue to threaten the United States. “(Kim Jong Un) has been very threatening… and I said they will be met with fire, fury and frankly power, the likes of which this world has never seen before,” Trump said.